If you have not noticed, there is a problem in our society. True, there are many problems, but one is particularly pressing. This is nihilism, the absence of meaning in the sense of both ultimate goals and present values. Nihilism stands behind much of the purposelessness, joylessness, and moral chaos of our society. It has been particularly devastating to young males in North America, the audience for whom Jordan Peterson’s writing and videos appear to be created and by whom they are most eagerly received. Peterson offers meaning, order amidst the chaos of our society; he proffers purpose, a way forward towards fulfillment; he even offers happiness, the reward that comes at the end of the intentional pursuit of meaningful living. Let’s be clear, what he is offering is a gospel, good news for the lost and oppressed. He is saying that hope, joy, and purpose can be found! But the gospel he offers turns out to be no gospel at all; it is a false gospel that leaves an even bigger hole than the one it was intended to fill. What is his answer? Take responsibility for being; take control of your present and choose to move forward in the future. Do not blame others for your circumstances or depend on another for rescue, but choose to walk the fine line between the chaotic unknown and the orderly known world by pressing forth to craft your own meaning. This, he claims, is what the individual soul longs for and is how we can lead to a collective flourishing—over against the atrocities of the 20th century (e.g. xxxv). The 12 rules he outlines all unpack this charge—”take responsibility for your being”—from different angles. For those who are interested, I will do my best to summarize his rules at the end of this review. Honestly, they are hard to summarize, for they are no more than hooks on which he hangs advice and philosophical tidbits. I think it will be more profitable to consider his agenda as a whole and why his gospel is no gospel at all. If you have studied philosophy, you will quickly notice that Peterson is heavily influenced by the existentialist tradition mediated through Heidegger, finding himself very close to the “Christian” philosophers Paul Tillich and Rudolf Bultmann. In Peterson’s brand of existentialism, the traditional questions of philosophy are collapsed into ethics, into the question of how should and do we live. Epistemology, the questions of truth and how we know it, and metaphysics, the question of standards for truth and the reality of experience, are collapsed into the central imperative of existentialism, “take responsibility for Being.” “Being,” capitalized by Peterson (following the translators of Heidegger) refers to the “totality of human experience,” both individual (my experience) and corporate (our experience) (xxxi). 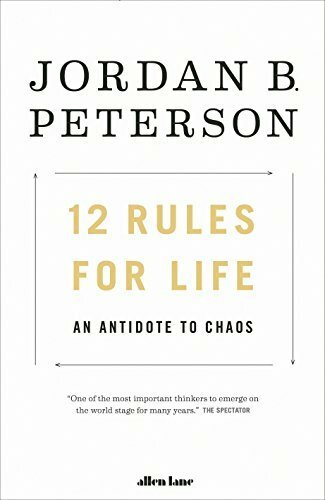 How Peterson thinks “taking responsibility for Being” should be done is unpacked through the 12 rules explained in the book. The definition employed early in the book is helpful: “We must each adopt as much responsibility as possible for individual life, society and the world” (xxxiii). In the tradition of the old liberal theologians (namely Adolf Harnack) and the existentialist Rudolf Bultmann, Peterson presents his philosophy of life in Christians terms, redefining doctrines of depravity, atonement, original sin, and faith in terms of existentialism (e.g. 55, 59, 189-90, 226). This brings us to the first problem of the book. Many Christians I have talked to see Peterson’s concern for Scripture and its centrality for western society as a refreshing breeze in modern thought. But it becomes clear early on (e.g. 43, 359) that Peterson’s interest in Scripture is not that of a Christian nor of a sort that is compatible with Christianity. Instead, Scripture is a deposit of ancient wisdom, insights spewed forth from the depths of Being itself (think of Being in the corporate sense above) (e.g. 104). The wisdom Peterson finds in the Bible is conveniently his own existentialist Jungian (as in the psychological system of Carl Jung) philosophy (e.g. Rule 2). It is not only that he rejects the inspiration and authority of Scripture, but he rejects its ability to communicate clearly. Instead, the Scriptures are demythologized to discover the moral teaching that is being communicated by its myths (xxvii, 34-35). This brings us to the second major issue. Christians should be concerned with Peterson’s handling of Christian doctrine and Scripture, let alone his false Gospel. Yet not even the non-Christian will find a plausible gospel here. Instead, those who follow Peterson’s rules are bound to find themselves in deeper despair than that which drove them to Peterson in the first place. Throughout the book he takes the stance of an old man dispensing wisdom, a scholarly authority dispensing his knowledge. Yet unlike the old person speaking from life-long experience or the authority speaking hard-earned truth, Peterson’s book does not escape the category of opinion. That is, he never offers a credible reason why we should believe the philosophy he offers. The nihilism to which this book responds emerged from a vacuum of truth and meaning; with god dead, as 20th century thought claimed, no objective standard was left for truth and meaning. It was quickly discovered that humanity was insufficient to the task of formulating their own meaning (and formulating your own truth is a contradiction in terms). Instead of returning the reader to an objective foundation, Peterson suggests that taking responsibility for being will produce its own meaning (199-201, 283). The problem, of course, is that meaning is not something that can emerge of its own accord. Peterson suggests that meaning will emerge as you take responsibility for being, yet this hardly seems the natural order of things. We are motivated to do something because we see it to be meaningful. We set goals and achieve them when we are assured they have meaning; we do not find meaning by setting goals. Without transcendence, without a God who orders reality, authoritatively sets out good and bad, right and wrong, there can be no meaning. Meaning is intrinsically tied with morality, pursuing what is good and true, and eschatology, pursuing the proper end. Without a purposeful plan for history, a distinct direction and a standard by which to evaluate progress in that direction, their can be no meaning. By leaving meaning and truth (157-159, 230) in the hands of the individual, Peterson never manages to offer a reasonable or satisfactory answer to the problem he is attempting to solve. If truth is the story you tell with your life (230), what foundation is there for the hundreds of moral evaluations he makes? What reason do we have to trust his advice, listen to his opinion, when there is no foundation for the claims he makes? Peterson offers some genuinely good advice and surely many people need to hear his call to take responsibility for life and do something with it (though I doubt those who need to hear this the most will bother reading the book). However, by giving no firm foundation for his advice, he ultimately sets the reader on the path to inevitable despair and disappointment. The advice may work for season, maybe two, but when some success is reached or when hardship comes, they will be confronted once again with meaninglessness. Like the rich and famous, they will discover at the end of their goals the same void from which they fled. There is ultimately only one good news, and Peterson’s philosophy is not it. The good news is that Jesus Christ has acted to save us from the wrath of God not that we can save ourselves and society from hopelessness and despair. The good news is that Jesus Christ will one day return and bring an end to all pain and misery and bring justice to all the atrocities of our time and beyond; the good news is not that we will work together to forge a better future. The good news is that Jesus Christ redeems us, calls us, and commissions us to live for Him in this world, giving us meaning. He has revealed the truth, and only this truth will set us free. Believing in Jesus Christ is the only escape from Nihilism, not a vague hope in “the intrinsic goodness of Being” and confidence in our own ability to craft truth and meaning. Rule 1, Stand Up Straight with Your Shoulders Back. This first rule begins to unpack Peterson’s charge to take responsibility. Basically, it is the charge to accept the reality in which we live—the world in all its difficulties—and take upon oneself the responsibility of imposing the chaos of potentiality—what is yet to be—into an ordered, meaningful reality. The practical implication of this is to act competent and able for this until reality matches your actions. Rule 2, Treat Yourself Like Someone You Are Responsible for Helping. Moving the charge a little further, Peterson commends the reader in light of the eternal dichotomy of chaos and order to live intentionally for the future, seeking what is best for oneself. The idea here is not to act for immediate happiness but to seek ones own good as a parent seeks their child’s, putting off potential pleasure for a fuller one. Rule 3, Make Friends with People Who Want the Best for You. If you are going to take responsibility for being, it is going to take the help of others. To succeed, you need to surround yourself with people with a similar forward-looking aim and who will not drag you back into the Nihilism whence you came. Rule 4, Compare Yourself to Who You Were Yesterday, Not to Who Someone Else is Today. Here, Peterson contends that it is important to live each day for the highest good, to see how you can behave in a way that improves the nature of things for yourself and others. Rule 5, Do Not Let Your Children Do Anything That Makes You Dislike Them. This rule appears to be a bit of scattered parenting advice. I assume in its context it should be taken as an application of rule 4 to the next generation, taking responsibility not only for your own betterment but for the betterment of the whole of society through the next generation. The themes of rules and discipline emphasized here are external applications, applications to others, of the sort of order Peterson commends for the individual, discipline and ordering ones own personal chaos. Rule 6, Set Your House in Perfect Order before You Criticize the World. In rule 6, Peterson is focusing in the personal responsibility aspect of his charge. The world will not change if we look outward to judge it. Instead, change begins by taking responsibility for our own being. Moment by moment, this looks like trusting yourself as guide to the appropriate action to take (157-159). If everyone does this, looks to their own Being and brings it into order, that might be when the world begins to change. Rule 7, Pursue What Is Meaningful. In a world of pain and suffering, Peterson commends pursuing good. The question that needs to be asked is, of course, what is good? Peterson contends that because we can identify not-good, such as the atrocities and suffering of the 20th century, there must be a good. He identifies good in the pursuit of meaning. On the whole, meaning—and therefor what is good—is manifest in the harmony of everything, of all Being. For the individual, it is living in the present and attaining balance between chaos and order (200-201). Rule 8, Tell the Truth—Or, at Least, Don’t Lie. For Peterson, telling the truth does not just mean being frank with people, it means choosing order over chaos. One step at a time, pursue truth by taking responsibility for your own Being, transforming your own chaos and that around you into order. This, of course, implies that “truth” is a personal virtue; “Your truth is something only you can tell, based as it is on the unique circumstances of your life” (230). Telling the truth is ultimately what the earlier existentialist philosophers called being authentic—recognizing and responding appropriately to the disorder in your life, not denying or rationalizing it, and aligning what you do with what you believe. Rule 9, Assume That the Person You Are Listening to Might Know Something You Don’t. Rule 9 is pretty self-explanatory, it is a charge to listen carefully and patiently and learn. However, he does not only mean other people, he also argues that listening to yourself carefully is equally beneficial. He makes a rather apt observation in this chapter that is worth repeating, on why many competing and contradictory forms of psychotherapy work: “People can be so confused that their psyches will be ordered and their lives improved by the adoption of any reasonably orderly system of interpretation. This is the bringing together of the disparate elements of their lives in a disciplined manner—any disciplined manner” (236). Rule 10, Be Precise in Your Speech. Rule 10 is rather like rule 9, only focusing on listening to yourself rather than others. The emphasis on precision is due to the fact that precision forces one to understand what is actually going on and how to deal with it. The practical application Peterson intends is aptly summed up on page 282-283, “Say what you mean, so that you can find out what you mean. Act out what you say, so you can find out what happens. Then pay attention. Note your errors. Articulate them. Strive to correct them. That is how you discover the meaning of your life” (emphasis added). Rule 11, Do Not Bother Children When They Are Skateboarding. This rule is full of scattered observation on current trends in society. The unifying theme to this rule appears to be that difficulty breeds strength, turns boys to men, and that the world needs strength, particularly the strength of men. Take responsibility for being despite its risks, and avoid coddling and protecting others so that strength doesn’t develop. Rule 12, Pet a Cat When You Encounter One on the Street. The final rule is essentially a theodicy, a solution to the problem of evil. Peterson suggests that Being appears to require limitation—such as that which produces suffering—to grow. Suffering, in this sense, is necessary and, in a sense, a good thing because it produces meaning and virtue, growth in being. The suffering that is implicit in such limitations is sometimes great. Yet, Peterson argues that by paying close attention, noticing the intrinsic goodness of being (e.g. petting a cat on the street) we can see the beauty of Being that emerges because of its limitations (347). Essentially, Peterson hopes to overcome the problem evil by appealing to the necessity of limitations which produces suffering, calling for faith in the intrinsic goodness of being, and practically taking time to behold the wonder of Being (its intrinsic goodness and the good produces by its limitations evident in it). As with the rest of the book, I find this incredibly weak intellectually and emotionally unsatisfying. The conclusion is even more so, so you may forget by the end of the book that the evil of this world—and its good—remain ultimately unexplained in Peterson’s philosophy. In sum, Peterson’s gospel is no good news at all. In light of a such a meager offering, I think the true good news of Jesus Christ’s life, death, and resurrection shine forth clearly.